Need more information about booking Home 4731191 ?
" The house is even better than the photos. It was clean, fresh, had everything we needed for our catch up visit (including a surprise bottle of fizz in the fridge! Thank you!) and had the most amazing comfortable beds and bedding! The property is so much more central than we first thought. Around a 15 minute walk from the train station and a very easy stroll into the middle of the town with lovely pubs and cafes on route. We will definitely return and would without doubt recommend to everyone who wants a visit to York. Jerry greeted us on arrival and was extremely helpful and very accommodating. Hopefully we will all return very soon!". There is full gas-fired central heating and on-demand hot water and double glazing throughout. With the exception of the kitchen and bathroom, there are fitted carpets throughout. There is also high-speed wifi broadband. 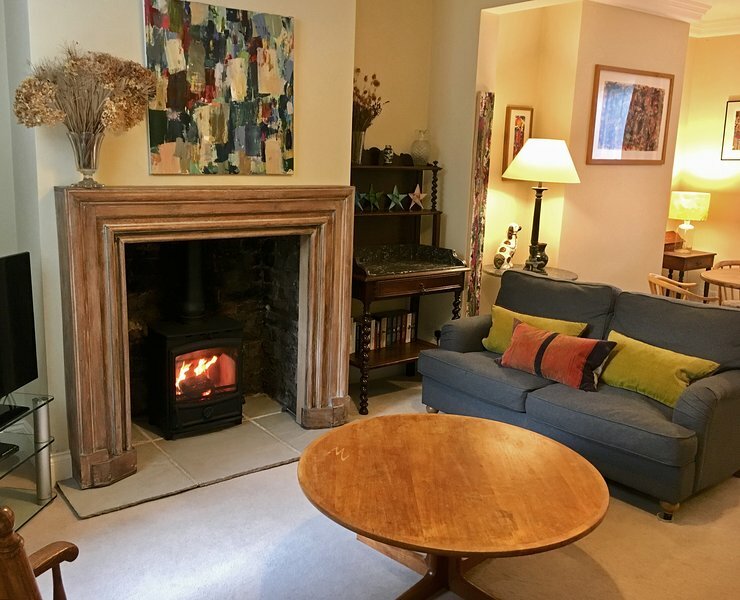 A large open plan sitting room and dining room are accessed from the hallway and are serviced by an extremely well-equipped kitchen to the rear. As well as all the basics, there is a Nespresso coffee maker, fitted Bosch dishwasher, gas hob, electric oven, extractor, and generous fridge-freezer. Upstairs, there are two super-comfortable double bedrooms: one with a king-size double bed, with sheep's wool mattress topper, Egyptian cotton sheets, built in cupboard (with ample hanging and shelf space), pretty vintage French bedside tables and an elegant dressing table. The second bedroom has a super king double bed, again with Egyptian cotton bed linen and sheepswool mattress topper. It can also be set up as twin beds. There is an oak wardrobe, chest of drawers and charming French bedside tables. The bathroom has a bath with shower, as well as an illuminated mirror, fluffy white towels and a generous supply of luxurious toiletries. The private, spacious and sunny garden provides a perfect setting for alfresco eating, be it a leisurely breakfast or a romantic dinner. There is a dedicated, monitored parking place adjacent to the house. For more information and photographs, just google 59stdenysroadyork to find our website. This House has 2 bedrooms, 1 bathroom and sleeps 4. It’s been listed on Holiday Lettings since 16 Jul 2014. Located in York, it has 31 reviews with an overall rating of 5. The average weekly rate varies from £802 to £916. Fantastic little place. Went with three friends for a girls weekend. So easy to access shops, bars and restaurants and great to have a parking space. The owners were lovely and kept in touch before our stay and welcomed us on arrival. Accommodation was immaculate and cosy with the added benefit of a bottle of prosecco chilled for us, thank you. Would definitely recommend a stay. Owner's reply: Thank Debra, very glad to know the weekend was a success and you liked the house. It was a pleasure meeting you all and you will always be very welcome. Jerry met us on arrival. Up-market home with High quality fittings and fixtures. Ample kitchen utensils with Nespresso machine, biscuits and sparkling wine. Well located, easy parking. Would certainly return. You can get in touch with Jerry & Jocelyn (the owner) through the contact form on this page. Send Jerry & Jocelyn (the owner) an email through the contact form on this page. Alternatively, if there’s a phone number on this page, you can call them. How do I contact Jerry & Jocelyn (the owner)? If you’ve already booked, go to Manage your holiday booking to view Jerry & Jocelyn the owner's contact details or send them a message. Or send Jerry & Jocelyn (the owner) an enquiry through the Contact the owner/manager form if you’d like a quote or more info first. When you pay online through the Book your stay form, a booking request is sent to Jerry & Jocelyn (the owner). You’ll find out within 24 hours whether they’ve accepted - no money will leave your account before then. You can also request a quote from Jerry & Jocelyn (the owner) through the contact form. The owner will email you the total cost for your dates and a link to book and pay online. Use the Book your stay form to pay provisionally online. You can pay by credit/debit card or PayPal. Jerry & Jocelyn (the owner) will have 24 hours to accept the booking and no money will leave your account before then. Why can't I call Jerry & Jocelyn (the owner) before booking? You’ll need to contact Jerry & Jocelyn (the owner) to do this. Send them a message in Manage your holiday booking or through the contact form on this page. You can request to change the dates or number of people on your booking via the Manage your holiday booking page. To change your holiday dates use the Edit booking button. If you need to change the number of guests staying then send Jerry & Jocelyn (the owner) a message. If Jerry & Jocelyn (the owner) agrees, they’ll send you a revised quote outlining the changes. You can review and accept/decline this from the Manage your holiday booking page. You’ll have 48 hours to take action before the revised quote expires.